What sets ROF apart from competitors is that we offer used Herman Miller office furniture for sale at up to 80% off the price of buying new. Offering both used and refurbished, ROF can work with you to meet any budget. Plus, when you choose to buy from us, we include our cubicle layout and design services at no extra charge, making your life that much easier. 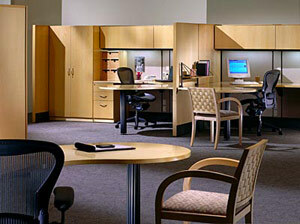 Add the elegance and classic styling of Herman Miller office furniture to your work environment with ROF.